I know Summer is more than half way over, but there is still plenty of time to gather up a couple of sandwiches, some chips, fruit, water, and some treats and have yourself a grand little picnic. Along with that picnic lunch it would also be handy to have a cozy and cute picnic blanket. Handy? Why yes it would be handy. You know what would be more handy, if it was easy and cheap to make. Are you saying to yourself, "Why that would be especially handy! Please do tell."? Well, okay...but just 'cause I like you. I love a project that requires just a few items. I especially love a project that requires minimal work and is cheap to throw together...I mean lets face it, I am a mom of four rowdy boys and I spend all my money on milk, bread, shoes, and jeans. This picnic blanket is one of those projects. 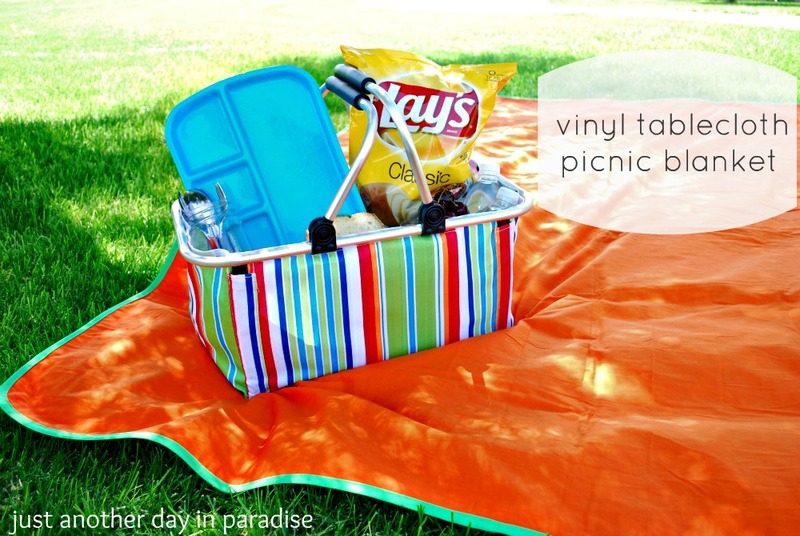 For this picnic blanket I simply used a vinyl tablecloth, a inexpensive $5.00 bed sheet, and a couple of packages biased tape. Pretty awesome huh!? Don't be confused by the both the extra sheet and the extra package of biased tape pictured. I got a little ahead of myself when I took the pictures of the supplies. You won't need the extra. You might see the other bed sheet in a different project soon...ooh so exciting. First you lay out the bed sheet wrong side up. Then you line up the tablecloth on top of the sheet, wrong sides touching. The fuzzy back of the tablecloth will help it stick to the sheet. Cut off the excess parts of the sheet so that it is in the same shape as the tablecloth on top. Keep the tablecloth and the sheet together wrong sides facing. Then after attaching the two packages of biased tape together, pin the tape in place all around the outside edges of the tablecloth. Fold over the biased tape and pin in place once more. Then sew the biased tape to the blanket. Roll up your blanket and stash it in your picnic basket. Lay it out, vinyl side down because well it is easy as pie to wipe off. ...and enjoy the last little bit of Summer. Cute! I like that it matches your picnic basket too! I totally love this idea! Heading to walmart this weekend!! Thanks larissa! You, my dear, are just too dang awesome. I LOVE this. SO COOL! So cute! Did you make the basket too??? This is such a great idea. I want to make one for myself and then make more for gifts. Wow! It looks great and so easy to make. This would be such a fun housewarming or shower gift.